This drawing is in pencil on A4 paper. As well as exploring perspective I wanted to try hatching techniques to describe tone. 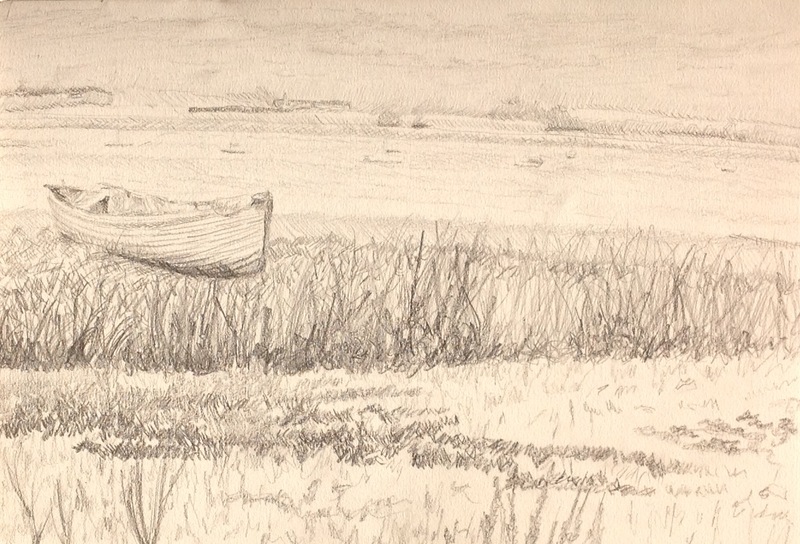 I have tried to keep the far trees soft and of a similar tonal range to the sky, but made the mistake of drawing too heavy an outline, which I had to rub out. I think the area of water is too pale and does not allow for a gradual darkening as you near the foreground, but the light reflecting on the river seemed at odds with this. Although it is hard to see in my drawing, I noticed how the clouds became smaller and less distinct the further away they are. As I moved towards the foreground my lines became darker and bolder. I worked quickly and quite like the marks that describe the tufts of grass, although I am not happy with the overall image it has been a good learning exercise. 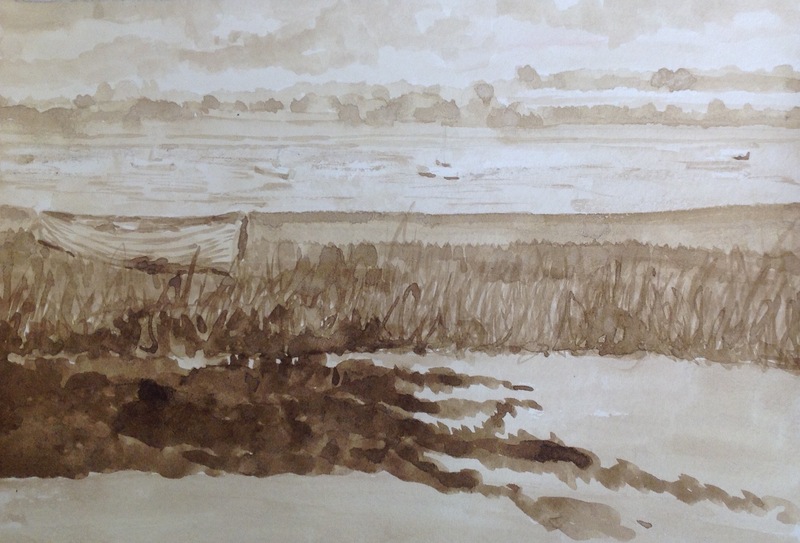 This time I tried a monochrome ink wash in my A5 sketch book. My idea being to gradually add to the concentration of ink and thereby increase the tone as I moved towards the foreground. The image is indistinct and hasn’t worked terribly well. I accidentally rubbed some paper off over the water area. This chalk drawing was a lot brighter until I over sprayed it with fixative. I moved away from monochrome and introduced shades of blue and green. I aimed to keep the horizon soft and light in colour and tone, gradually strengthening colours as I moved into the foreground. I think I have achieved better ariel perspective with this landscape, but more detail in the foreground could have improved this. Here I have used coloured pencil and graphite soluable pencils . I decided to crop this image from a photo I took in a local woods. 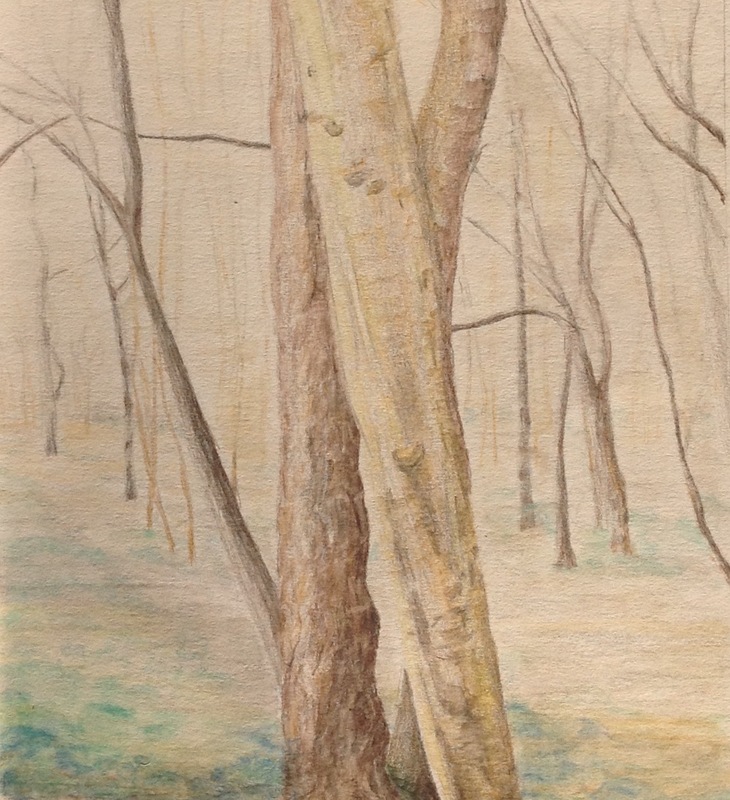 After looking at the prints of Chrissy Norman in my research, I noticed how she has used similar scenes of trees and gradually faded out to the background to show perspective. 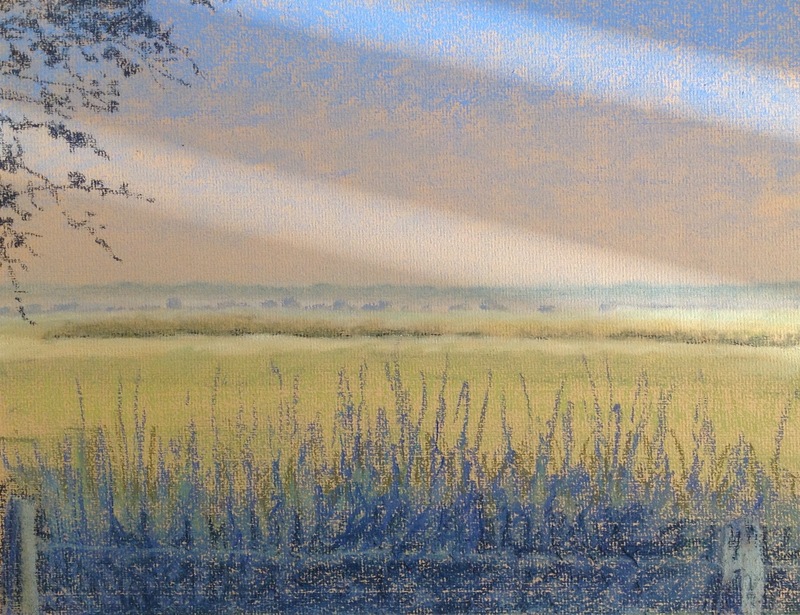 I felt the coloured pencils would give me greater control to describe this tonal variation and this photograph would give me the opportunity to focus on details in the foreground and emphasis this distance. Previous Article Project 4 Exercise 2 : Angular perspective.